Christine is a committed cat lover and has been working at Phoenix for the past eleven years. 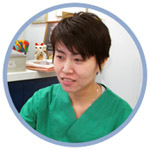 She has been a veterinary assistant since 1996, having worked with several different veterinarians before coming to work with us. She has a Certificate II in Veterinary Nursing and is part-way through her Certificate IV. Stella is our chief receptionist and first started working with us nine years ago. Luckily for the rest of the staff she keeps the front desk running in an efficient and orderly fashion. Yoyo is our part-time nurse working on Sundays. She is very caring and gentle. She is in love with Poodles.